Junior Football in Falkirk has always been a very haphazard affair, there is no really strong tradition in the town. There is a long tradition in some of the outlying areas, but never really strong unlike say in Glasgow, Ayrshire or East Lothian. In Falkirk it has always been overshadowed by the senior clubs [few other 'conurbations' in Scotland carry three League sides in such proximity]. 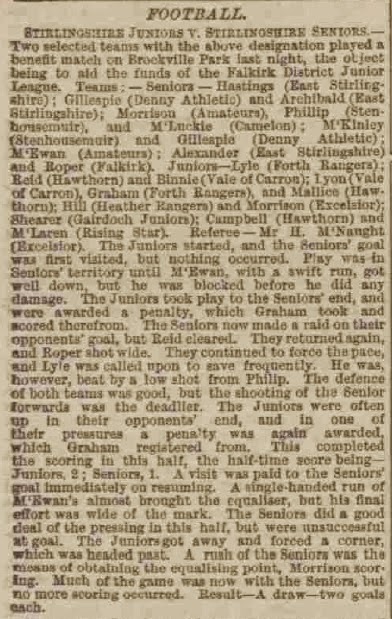 But right back in 1890s there were plenty of junior sides in Falkirk alone. For the most part they played on Victoria Public Park, but some had their own grounds, Falkirk Hawthorn played at Firs Park when East Stirlingshire were still playing in Bainsford, and Falkirk Thistle played on Princes Park to the South of Town. This along with borrowing Brockville for the big games [and Saturdays when Falkirk were away] they struggled through. But although there were plenty of clubs, not all were big enough to make the local leagues strong enough. Every year they were re-organised, and every year it would struggle to be completed, both through lack of interest. Some problems were obvious, four big local sides Denny Athletic, Dunipace, Heather Rangers [Stenhousemuir] & Broomage Albion [Larbert] played in the Stirling & District Junior League. These would have been better off playing with the Falkirk, Grangemouth & Bainsford sides, alas they did not. On top of this even back then there were so many Cups that the end of seasons were just, well, like they are now, there were many moves towards a Stirlingshire League before the main one was eventually set up, but more often as an afterthought, often concocted by the teams left out. Sometimes, like the Midland Junior League it was run alongside the Stirling & Falkirk Junior Leagues with the best teams from both, of course this meant two sets of home & away matches over & above cups & replays, so inevitably led to chaos. What this meant was that both the leagues & the clubs themselves struggled to survive and had to play even more 'benefit' games to keep going. The point of this post, played on Tuesday 26th April 1898 for the Falkirk & District Junior League for the first time a representative side of Stirlingshire Juniors met a Senior Stirlingshire side [though made up solely of amateur players in the seniors] and did pretty well all told drawing on the hallowed turf of Brockville Park.